HeartCry Missionary Society > Reconciliation Baptist Church is Constituted! Reconciliation Baptist Church is Constituted! For some readers, such an event may require some explanation. In some missions movements today, if a group is gathering regularly for Bible study it is claimed that a ‘church’ has been planted. As you will see in this article, the Reformed Baptists in Africa with whom HeartCry partners are much more careful in saying that a biblical church has been started. For the past 3 years, Grace Baptist Church in Kisumu, Kenya has functioned as Bill Issa’s ‘sending church.’ The elders and members of Grace Baptist have provided support, oversight, and accountability for Reconciliation Baptist until they had adequate membership and leadership to be set apart as an autonomous church body. I asked Sam Oluoch, pastor of Grace Baptist, to explain the process of moving from a ‘church plant’ to an autonomous church body and the history of their work with Bill Issa. “In the missions policy of GBC-Kisumu, we have followed the pattern of the Antioch church in Acts 13. For one to be sent out as a missionary/church planter, he must be an elder or fit to qualify as an elder from either amongst our own membership or a servant of God providentially brought to us by God. It is with this in mind that all our missionaries have to be vetted and approved by the church elders and presented to the church to vote for such a man. Once approved by the church, it is the task of GBC members to support the missionary. We therefore must find a way of providing for the missionary from amongst ourselves. If financial support is not possible (most of the time this is a challenge), it is the duty of the church leaders to find willing partners who can stand with us financially to support our missionary as we give oversight and accountability. We expect the missionary to engage in his work whole-heartedly, evangelizing and pastoring the group the Lord raises for him. As this goes on, we believe some people will be saved and the number gathering should rise from year to year. This may happen quickly, or sometimes take quite long, depending on how God blesses His work. Normally, we aim for at least 10 or more converts before we start thinking of constituting a church. Before then, the church-plant work does not have its’ own elders and deacons, and much of these services are provided by the sending church. At the point of constituting, we see that mature men have been raised to be counted as elders and deacons, and therefore, there is leadership in place to take the baton from the sending church leadership. As for Bill Issa, he has started on solid ground, with brother David ready to serve as a co-elder and three men qualified as deacons. This is a rare gift. In August 2013, I was in Lusaka, Zambia to attend their annual family conference. Bill Issa had been directed to this same conference by a friend in the USA, hoping he would receive greater exposure to reformed teaching. Although we had never met, we shared a room in Lusaka at the church guest house. This was intentionally arranged by the conference organizers so that Bill could bombard me with Bible questions that he was struggling with. We jelled very well throughout the conference period and after. 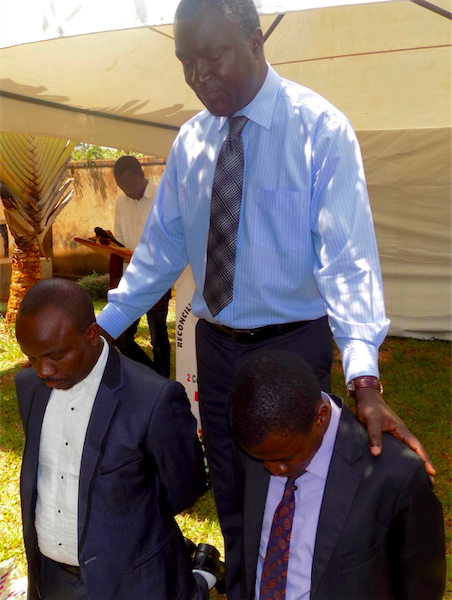 In August 2017, Pastor Paul Odera (HeartCry missionary) and Deacon Osborn visited Kampala to teach on the characteristics of a biblical church, the qualifications of church membership, the ordinances of the church (Lord’s Table and baptism), and the fellowship and financial support of the church. Bill also helped with these teachings. In September 2017, my co-elder, Ken, and I were scheduled to visit RBC and teach on the subject of elders and deacons - the need for, plurality of, and their qualification and duties. Then the plan was to interview those who had applied for church membership. This visit did not take place according to schedule, due to the volatile political situation in Kenya. Instead, this was covered the day before constituting. On Saturday, November 25, 2017, we held the teachings on elders and deacons from morning to evening, and reviewed the teaching done in August. Then, with Bill, we interviewed those who had applied for membership. The twelve qualifying members voted to recognize David as elder, and for Bill to transition from being GBC Kisumu’s missionary-pastor to RBC’s pastor. Then they also confirmed the 3 deacons.